there's a Q&A at the bottom or you can always PM Becky at Milk; if she doesn't get back to you quickly, try rainbowsoliloquy (at) gmail dot com - that's her email. 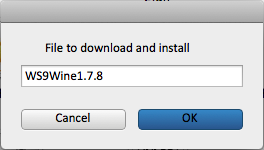 Step 1: Download and install wineskin from here. It will automatically unzip itself in your downloads folder on most macs, or double-click to unzip, and then just drag and drop the wineskin winery app into your applications folder. 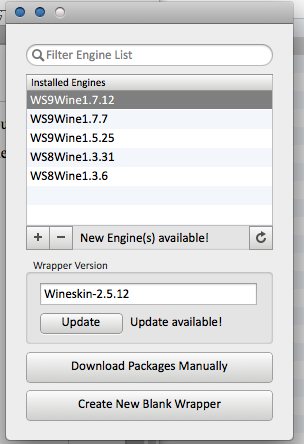 Step 2: Open the wineskin winery app double clicking. You will get a window that looks like this, but there will be nothing under the "Installed Engines" column. 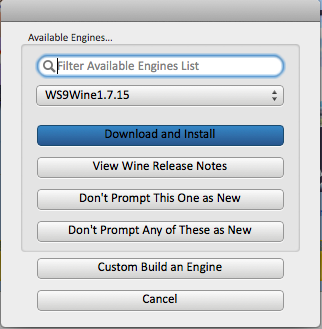 Step 4: Into the 'Filter Available Engines List' text box, type this: WS9Wine1.7.8. In the drop down menu below that box it will then change from whatever it said before (in the picture above it says WS9Wine1.7.15) to saying WS9Wine1.7.8. At this point, press the button highlighted in blue above that says Download and Install. Step 4: At this point, it should give you a popup box that says what you just typed in (picture below this). Click OK. Step 5: It will bring up a window that says Create a wrapper using Engine: WS91.7.8 (I messed up when I took the photo so it says 1.7.12 instead of 1.7.8). 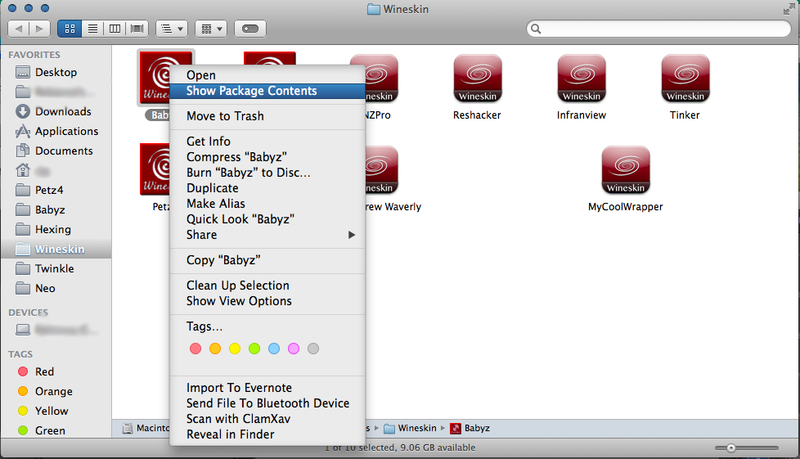 It will ask you a to name your wrapper - call it Babyz and then hit okay!� It will think and build the wrapper for a while, this is normal, just be patient.� It calls it a wrapper because it "wraps" the windows application babyz in an app format that your mac can run. Step 6: When your computer is finished thinking, it will bring up a popup window that looks like this, with LalaLa.app replaced with Babyz.app (I already have a Babyz.app for my game so I couldn't make another one for the tutorial). Click the 'View wrapper in Finder'. This will take you to /Users/YourMacUsernameHere/Applications/Wineskin. Inside this folder will be your Babyz.app (I have a bunch of other stuff in here too but you won't!). Select Babyz.app and command-click on it so a context menu comes up, and select Show Package Contents. �Step 7: This will take you to inside Babyz.app. Any time in the rest of the tutorial that I talk about the main babyz.app folder, I mean this one. 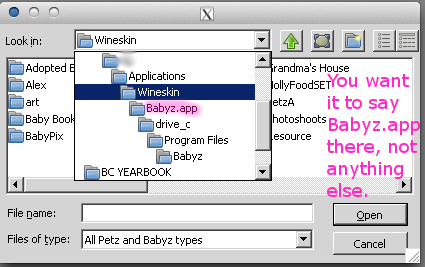 There will be a folder called Contents (don't go in here), an app called Wineskin that you use to set up babyz, and a drive_c folder. Now here is the question: are you installing babyz from the installation exe (CD or whatever, installing from the beginning) or are you using a pre made version of babyz (like if you have it in a backup, already all installed, with babyz.exe, resources folder, etc). 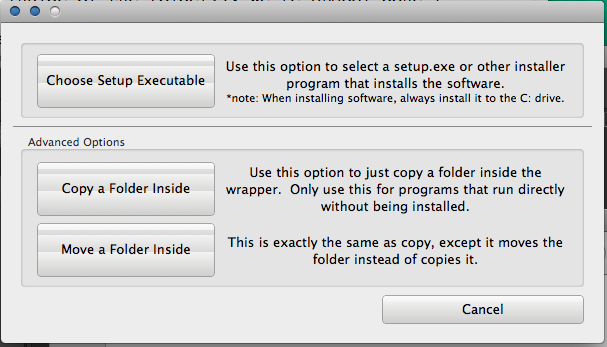 If you are installing from an exe, go on to the next step (step 8), and if you are using an already set up version of baby, go on to step 9. Make sure that Babyz.exe is selected. Then you're DONE - you have babyz installed. This will work 99.99% of the time, but if it doesn't, try Manual-Drag-n-Drop Step 9, which is at the very bottom of the tutorial (since nobody should ever need it). Make sure Babyz.app is selected. You're all set! See I told you this wasn't too bad! Step 10 (let's play BABYZ!) 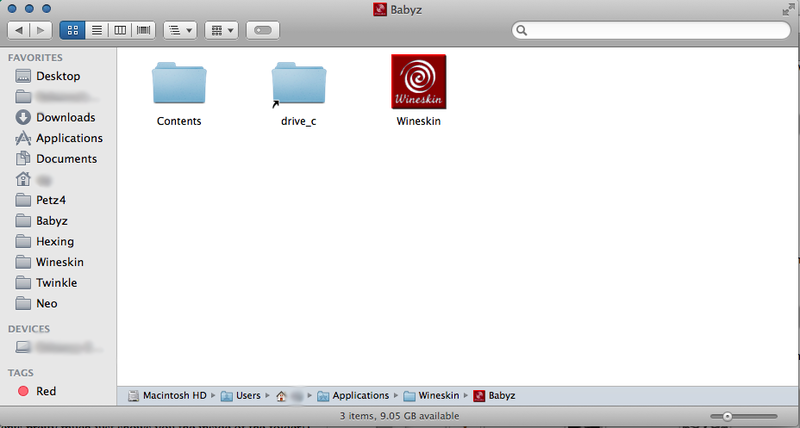 To run babyz go to your applications folder, and then into wineskin. Double click on babyz.app, and the game should start. When you quit, you should exit via the game menu and not using apple-q; if you do it using apple-q your kids won't age or remember anything. Your game files are inside the game wrapper - to install hexed clothes for example, you would go to the� Wineskin folder, right click babyz.app and do show contents, and then go into the drive_c/Program Files folder. There will be your games main directory, with Adopted Babyz, Resource/Clothes, etc. We're super close to done, but not quite. Everyone needs to install petza. Most people will also want via voice to talk to their babyz. If you are installing viavoice from the exe that comes with the game or petza from an exe, hit the choose setup executable button and select the exe that you're installing. It should install just like it would on windows. 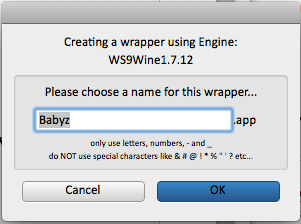 When wineskin asks you at the end what the main exe file is make sure it's set to babyz.exe, just like you did when you installed the main game. Then voila, Petza/viavoice is installed. YAY you're all set up to play Babyz :)! Q:I installed viavoice/petza, and now when I double click babyz.app, babyz doesn't start!! A. Go into the main babyz.app folder. 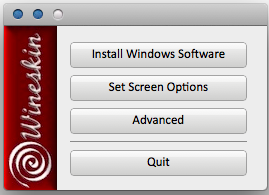 Start wineskin just like when you installed babyz, and hit the advanced button. 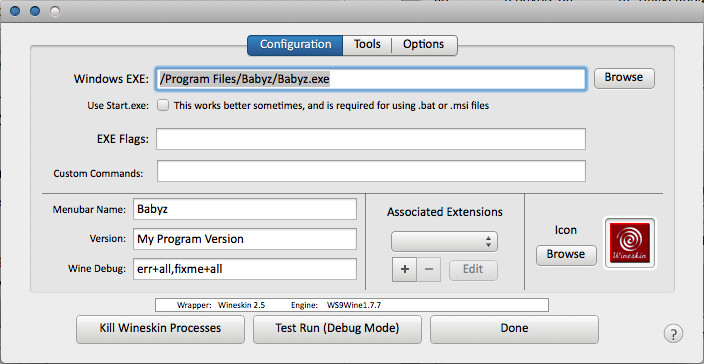 Under the configuration tab there's a setting for the exe file - click the choose button and navigate to the game's main folder in program files and select babyz.exe. Then exit wineskin and try again, and babyz should now work! Q: I need to use carolyn's zip file to install via voice. How do I do this? 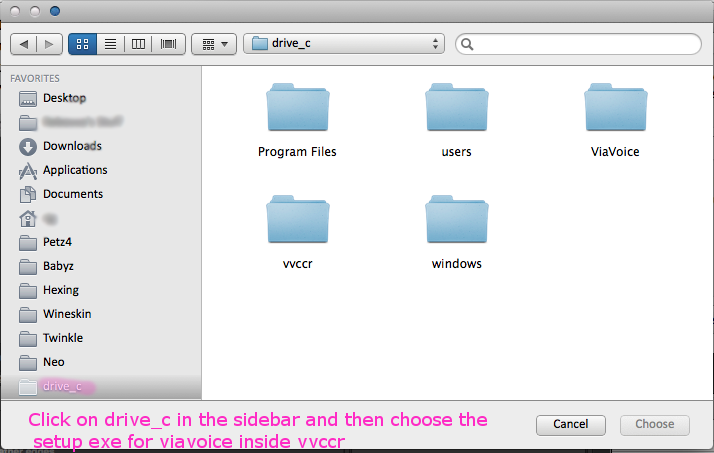 then you can go into the vvccr folder and select the setup exe for via voice. When you're done installing, it'll give you the popup asking about what the main exe is, and make sure it's set to babyz.exe. Q: I got viavoice errors when I started babyz. Help! You might get some via voice errors when you start up babyz, but it usually works anyway when you hit the yellow mic button. 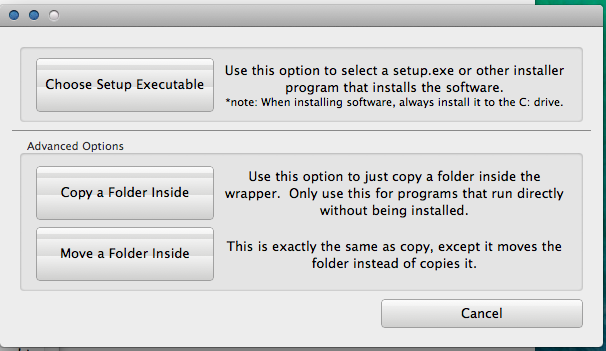 If not, try reinstalling via voice using carolyn's zip file (see above). Also try resetting the registry (PM Becky at Milk for help with that). Q: I'd like to hex. A: If you'd like to hex, you need to do the process you did to install babyz again (steps 4-8/9) to install LnzPro and Tinker each into THEIR OWN WRAPPERS (very important). 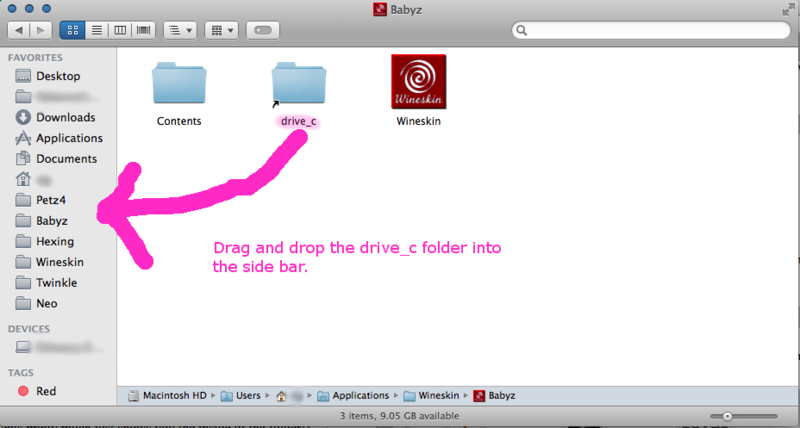 Finding the babyz folder in LnzPro can be a little bit tricky, but it's easy if you keep going up through the directories until you find the wineskin one and go into babyz.app (not lnzpro.app's version of drive_c which is where you'll start out). Just look at the picture below if you're confused! That's pretty much it! If you need any other help, PM Becky at Milk. Q: Regular Step 9 didn't work. What now? Hit the browse button and navigate to the Babyz folder, and then select Babyz.exe, so it looks like above. CONGRATS, you have Babyz installed! !